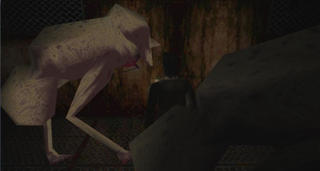 The Silent Hill series has some gnarly monsters, from demonic dogs to the iconic Pyramid Head. A modder looking at the original game’s code has uncovered some lost creatures and brought them back to life in all their horrific glory. Modder roocker666 first noticed something out of the ordinary last Saturday after extracting Silent Hill’s files and finding assets for six unused actors in the game’s character folder. The assets were labeled FRG, EI, MKY, OST, BTFY, and SNK. With a little bit of work and modding magic, roocker666 was able to replace some of the game’s creatures with these previously unseen monsters. The results are creepy. While some of these will play to people’s phobias (like my absolute dread of giant bugs), the strangest creatures really hit the abstract and misshapen monster feel that the series is known for. These hidden monsters lay dormant on Silent Hill’s disc for nearly two decades. I think I speak for us all when I say that while I’m glad this old data was discovered, I hope these critters stay far away from my dreams.